Witch-cursed, legend-haunted Arkham, whose huddled, sagging gambrel roofs and crumbling Georgian balustrades brood out the centuries beside the darkly muttering Miskatonic. 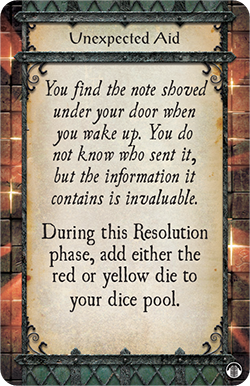 The Gates of Arkham expansion for Elder Sign, a cooperative dice game of Lovecraftian horror will be available at The Wandering Dragon on Wednesday, February 11th. Gates of Arkham takes the struggle against the Ancient Ones out of the museum and into Arkham, where monsters lurk in darkened alleyways and bystanders become the victims of gang rivalries. 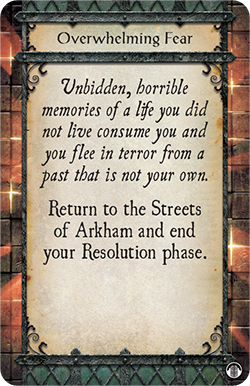 In the featured Streets of Arkham game mode, new Arkham Adventures and Mythos decks replace the original Adventure and Mythos decks, sending investigators on adventures throughout the city as four new Ancient Ones threaten to arise. Only by braving the city’s ubiquitous perils can you triumph against the ancient and awakening evil. From its colonial-era founding, Arkham has been a refuge for witches and criminals, and legends suggest that since prehistoric times it has been home to some of the darkest forces imaginable. The turrets of Victorian homes, classical facades of Miskatonic University buildings, and tall booths of Velma’s Diner concealed inhuman horrors long before monsters came alive inside the museum. In the Streets of Arkham mode, investigators choose which location in Arkham to visit without knowing what will happen to them inside. Arkham Adventure cards are played facedown, each featuring a specific location on the back. Some locations lure you towards them by offering rewards, such as the chance to regain sanity or gain a unique item. Others make terrible things happen at the stroke of midnight, for example, causing a ravenous Night Gaunt or giant Leng Spider to appear. 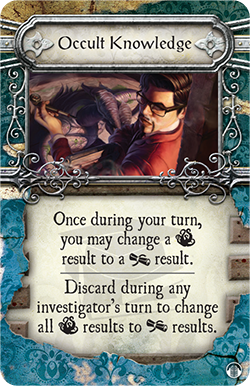 When an investigator arrives at a location, the card is flipped over to reveal the Adventure. At Hibb’s Roadhouse, you may participate in dark dealings with suspicious figures, or get caught in a police raid on the Sheldon gang. In the Curiositie Shoppe, you may discover a sealed ornate chest from another civilization, or you may arrive to find the door smashed open and a trail of blood leading inside. Once the adventure is revealed, there is no turning back. If you fail in your tasks, other investigators may come to your rescue, or you may find yourself running back out into the streets, drained of sanity and stamina. Success may reveal an elder sign or, at the very least, provide some clue, item, or skill to help you persevere. As you navigate Arkham and survive its unpredictable Adventures, you’ll acquire lasting knowledge and enhanced abilities in the form of skills. For example, you may elicit some Occult Knowledge from a Miskatonic University professor. Unlike items, spells, and allies, skills may remain with an investigator as long as he lives, or be sacrificed in a moment of necessity to gain an even greater advantage. Some locations and items give investigators membership in Arkham’s most influential organizations: the ruthless Sheldon gang, a bootlegging syndicate as infamous for their murders as their moonshine, and the Silver Twilight Lodge, an ancient and mysterious organization rumored to practice dark magic in the dead of night. Memberships sometimes allow you to bypass a task and sometimes offer extra rewards, such as an elder sign or an ally, for completing an Adventure. Given Arkham’s perils, you may want to play one of the eight new investigators who are well versed in Arkham’s secrets or the bizarre physics of Other Worlds. 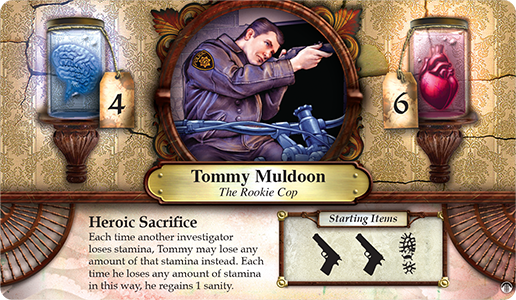 As a cop, Tommy Muldoon knows Arkham’s criminal underworld as well as the Sheldon gang bosses. More interested in helping others than himself, Tommy can prevent another investigator from losing stamina by giving up his own– and gain some sanity in the process. Being a cop, however, doesn’t prevent Tommy from joining the Sheldon gang or the Silver Twilight Lodge. All secret organization have their police contacts. 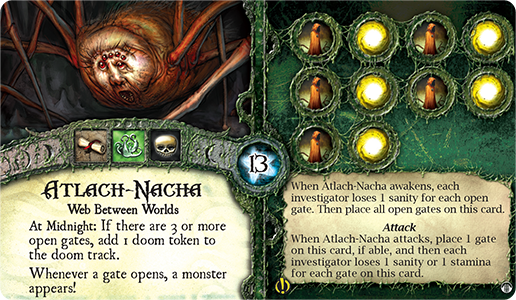 Gates of Arkham introduces four Ancient Ones who tear at the fabric of space and time as they begin to awaken. One of them is Atlach-Nacha, who is stirring in his transdimensional home and beginning to weave the worlds together, tugging at time and space, sapping the investigators’ sanity and stamina, and causing gates to Other Worlds to open across the city. Gates tie specific locations to Other Worlds, perhaps linking the Miskatonic Library to the Far Side of the Moon, or Velma’s Diner to the cavernous, underworld Vaults of Zin. You cannot visit a location that has a gate without slipping through to the Other World, and you must resolve the Other World adventure in order to seal the gate and return to Arkham. The more open gates in play, the more monsters spawn, and the faster doom approaches. Not only do gates breach the physical environment, the awakening Ancient Ones wreck havoc in all aspects of life in Arkham. The social, psychological, and cosmic chaos is represented by Event cards, which many locations force you to draw before you undertaking any tasks. Events create unpredictable conditions that last the length of your Adventure, and may hinder or help you. Overwhelming Fear could cause you to flee from a location in terror, or a sympathetic stranger may come forward and offer you Unexpected Aid. Can you Survive the Streets of Arkham? You never know who or what you’ll encounter among Arkham’s crumbling buildings, desolate squares, and unlit roads. At any moment a tentacle could reach out for you. Around any corner may be the entrance to some Other World. As you scour the city for elder signs, you could become involved in criminal rivalries or clandestine rituals, arrested by the police or lost in the halls of an insane asylum. Only one thing is certain: the Ancient One is regaining strength, and it is up to you and your fellow investigators to save not just the museum, but Arkham and the entire world. Gates of Arkham will be available on 2/11 at The Wandering Dragon!